Formed under several names before changing to Strid in 1993 by Storm, Ravn Harjar, and Jardar (not to be confused with the Jardar from OLD MAN'S CHILD or REQUIEM.) 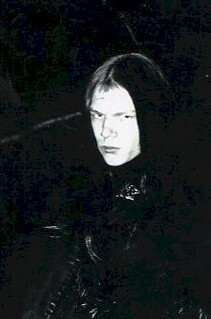 Strid released a demo called "End of Life" in 1993, which consisted of one eleven-minute song. Strid then got signed to Malicious Records in 1994, and released a 7" EP. 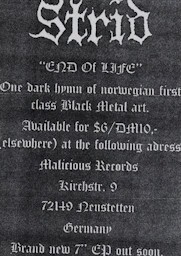 Malicious then re-released the "End of Life" demo with a new logo and pictures, also including the 7" material. Original version. Regular three panel Xerox covers that just has the band members names and address. No lyrics. Recorded onto studio tapes. Re-released later on by Malicious Records as a EP that included the 7"EP as well.